Although Santa Barbara is approximately 5,500 miles and six hundred years removed from the center of ninja activity in Medieval Japan, this city is, surprisingly, a veritable hotbed of ninja goings-on. At last count, a full 41 residents of Santa Barbara consider themselves to be members of that stealthy group of warriors. While that may not sound like much, it’s a fairly large proportion, when you consider the exclusion and secrecy which typically surrounds highly specialized assassins. The Santa Barbara Ninja Club, with its virtual headquarters on MySpace, only admits members who have posted pictures of themselves dressed as ninjas, and sternly expels any members who fail to do so. While casual speculation might lead one to believe that years of rigorous training are necessary to qualify as a ninja, it seems that a MySpace account and a tight-fitting ninja suit are really the only things required. Of course, it’s to be expected that a ninja, in today’s society, might be a little different from the iconic black-clad assassin, originally popularized as a cultural element in seventeenth-century Kabuki theatre. While Japanese ninjas might have been found single-mindedly pursuing a deadly enemy in the dark streets of Medieval Kyoto, the modern ninja, it seems, has fewer opportunities to display his or her prowess. 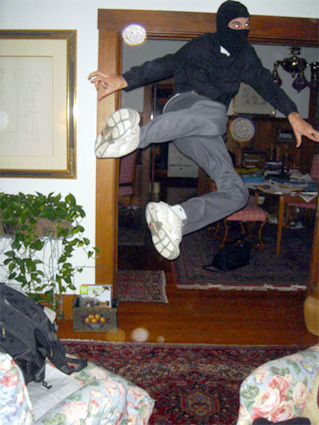 Judging by the photographs provided by the Santa Barbara group, the modern ninja also enjoys the possession of floral-upholstered furniture – upon which he may presumably sit to watch television, after having leapt over it a few times in true ninja style. Ninjas also face similar problems to those dealt with by other, less deadly elements of society. While members of the Santa Barbara Ninja Club do post ninja-related information to the forum, others log on simply looking for a roommate – presumably one who will be understanding of their wall-climbing, furniture-leaping, and secretive nighttime forays. Given the fact that 21st-century California has a much higher population density than fifteenth century Japan, modern Santa Barbara ninjas must also face the fact that their every move can no longer be shrouded in mystery. Ninjas have been sighted at the Subway Restaurant in Solvang, where they graciously posed for photos, and painting graffiti on the U.S. Bankruptcy Court building. It has become harder and harder, in short, for ninjas to conduct ninja business in solitude. This resurgence of ninjas is not limited to Santa Barbara, of course. The Official Ninja Webpage, Real Ultimate Power, is an excellent resource for anyone looking to become a ninja, meet or hire a ninja, or simply learn what modern ninjas are all about. It should be stressed that this website, like that of the Santa Barbara Ninja Club is actually about real ninjas – anyone simply posing as one should find their own forum.